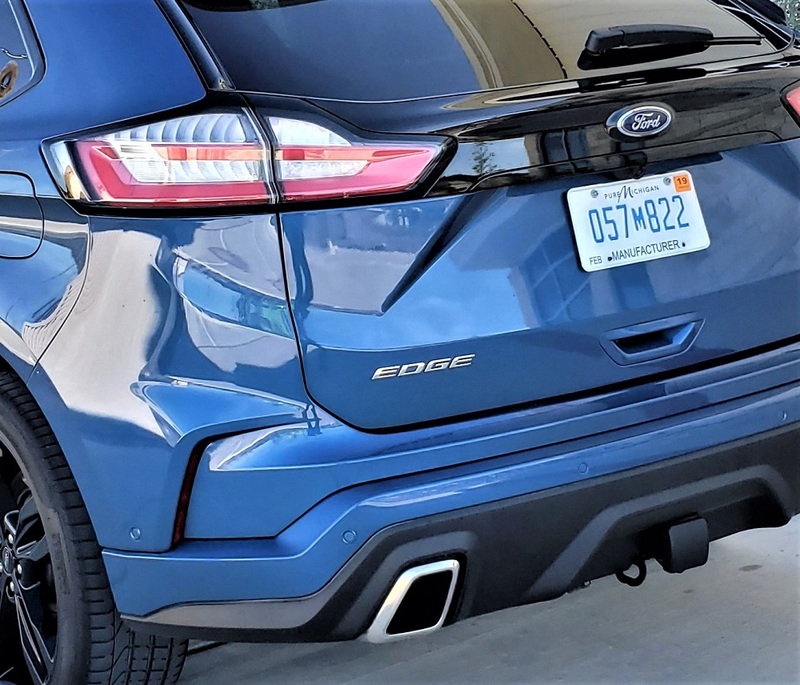 A month or so ago, we drove and reported on the new 2019 Ford Edge Titanium AWD (see link) noting that there was also a Ford Performance Team version available – the Edge ST. 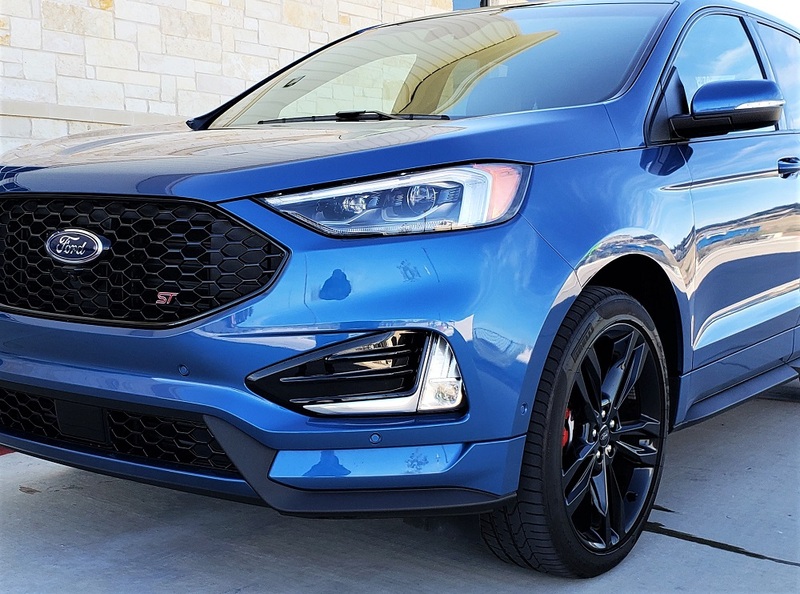 Borrowing an Edge ST for a week, we found the additional 85 horsepower and 105 lb.-ft. of torque mounted on performance underpinnings turned the very good, but mild-mannered, Edge mid-size crossover into a serious performance machine. 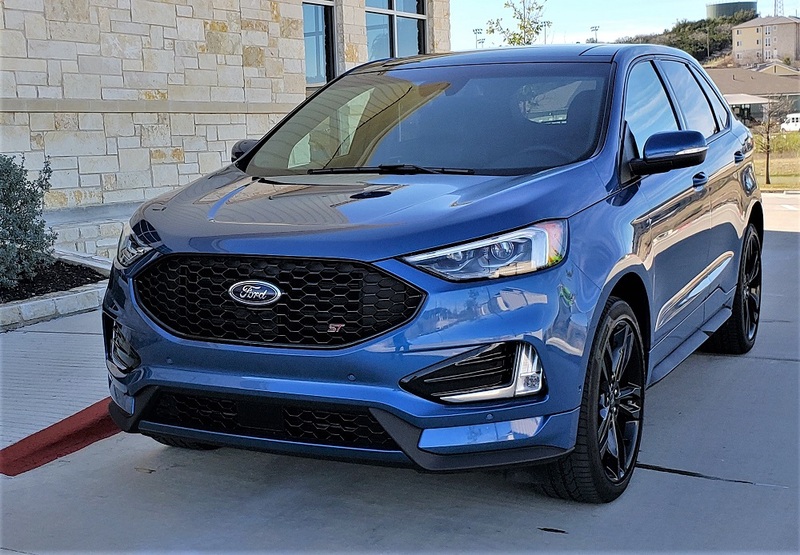 Our test 2019 Ford Edge ST AWD had a base MSRP of $42,355. Adding the ST Equipment Group and ST Performance Brake Package – plus delivery – the Edge ST priced in our driveway at $52,125. 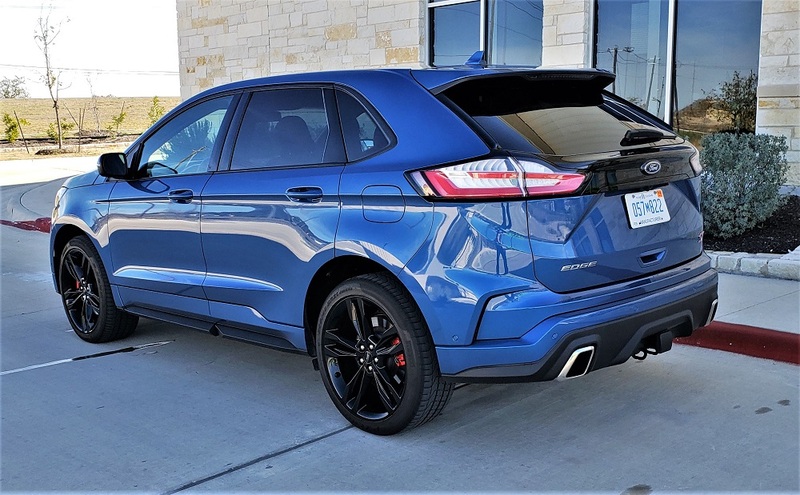 You need look no further than under the hood and at the running gear of the new 2019 Edge ST AWD to confirm it is from the Ford Performance Team. Powering the ST is the specially-tuned Ford 2.7L EcoBoost V6 engine pumping out 335 horsepower with 380 lb.-ft. of torque. It is mated to their performance-tuned 8-speed SelectShift automatic transmission with rotary dial, Selectable Traction Control, Sport Mode and manual shift using the steering column mounted paddle shifters. The V6 runs well on 87 octane fuel, but will give you a bit more ‘pop’ using 93 octane and crafted to deliver some dual exhaust noise, we suggest adding a bit more by running in Sport mode. 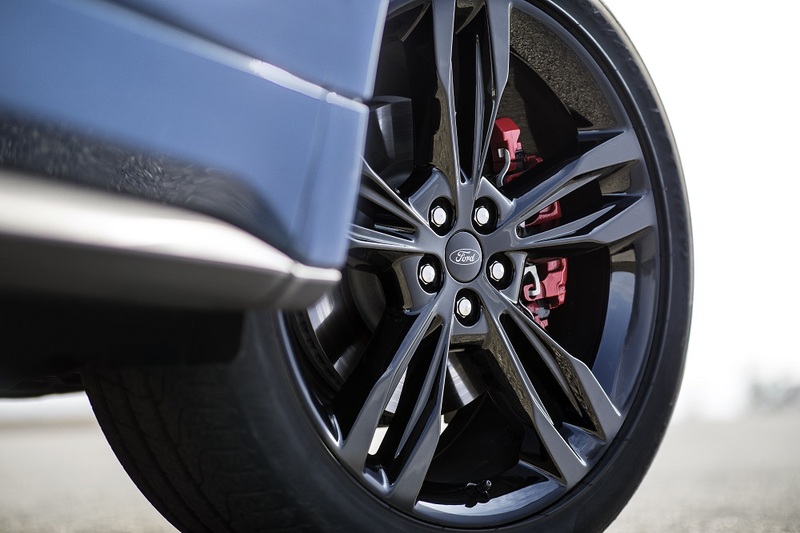 Underneath, the Edge ST transfers power to the road through the Intelligent All-Wheel Drive – with disconnect system for improved handling and traction around town and on the highway. Its Ford Performance Tuned Suspension plus ST Performance Brake system and Electric Power Steering delivers good driving manners on all road types and in all conditions. For the record, the fuel economy rating for our Edge ST AWD is 19/26 mpg city/highway and 21 mpg combined. 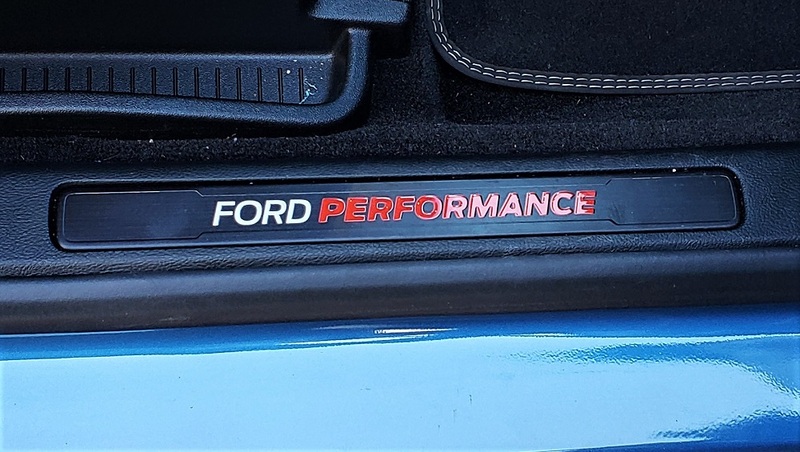 There was no mistaking our test Edge ST AWD as it sat in the driveway resplendent in its signature Ford Performance Blue Metallic with Ebony interior. Fitted with 21-inch Premium Gloss Black Painted Aluminum Alloy Wheels mounted with P265/40R21 Summer-rated tires – it looked like it was moving just standing still. Unique to the Edge ST were its distinctive Colorado Red painted brake calipers, Gloss Black front fascia and wide mesh grille with ST Logo. Additional ST features included its Black Headlamp Treatment, Black Beltline Molding, and body color lower cladding and bumpers front and rear. 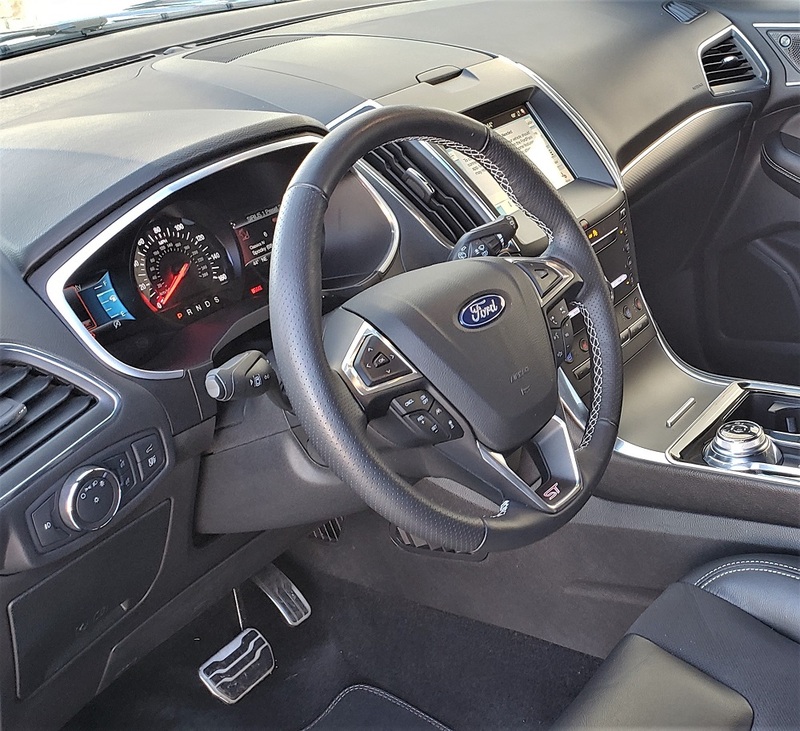 Our Edge ST interior elements included a Power Panoramic Vista Roof with Power Shade, Hands-Free, Foot-Activated Power Liftgate that opened wide and high for easy cargo loading, Ambient Interior Lighting, Dual-zone Climate Control and Ford Performance Illuminated Door-Sill Scuff Plates. The Contoured ST bucket seating was superbly generous and comfortable. It was ‘ST’ all the way, leather trimmed with Miko inserts and wide bolsters, City Silver stitching and Embossed ST logo. Driver and passenger were 10-way power and both heated and ventilated. Rear seating was 60/40 split also with Miko inserts and a fold-down armrest. They were heated and both reclined and folded flat. There were second row seating reading lamps and the Dual-Zone Electronic Climate Control had second row floor vents and adjustable Rear Console Vents. Accents were metal plated throughout including aluminum pedal covers and a Brushed Weave Aluminum instrument panel applique. The steering wheel was perforated leather with City Silver Stitching and ST Logo. 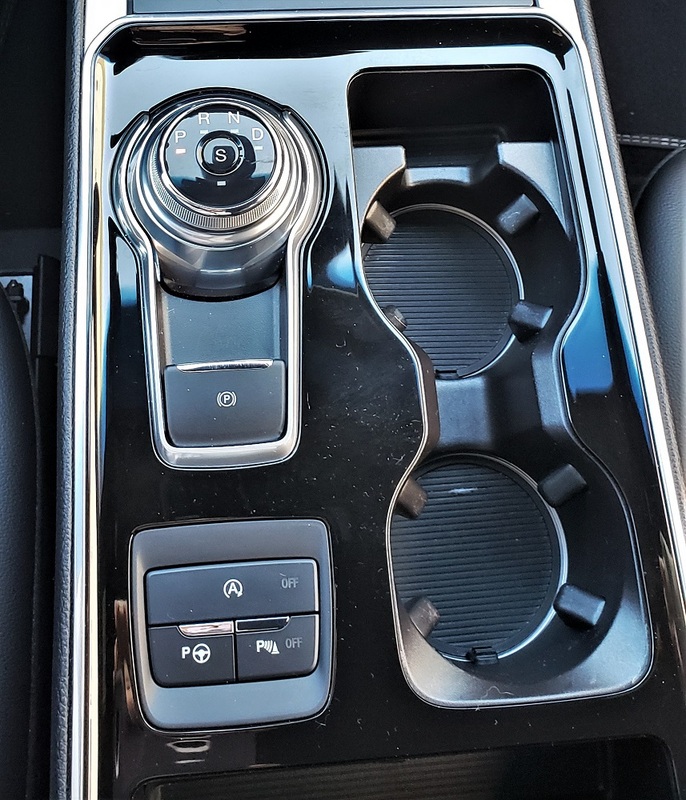 Functionally we like the placement of the eight cupholders and the four grab handles plus the size and ease of access to the cargo area. The cargo space behind the second row is just over 39 cubic feet. It has tiedowns, cargo cover, LED cargo light and a 12V power outlet plus more space under the cargo floor. 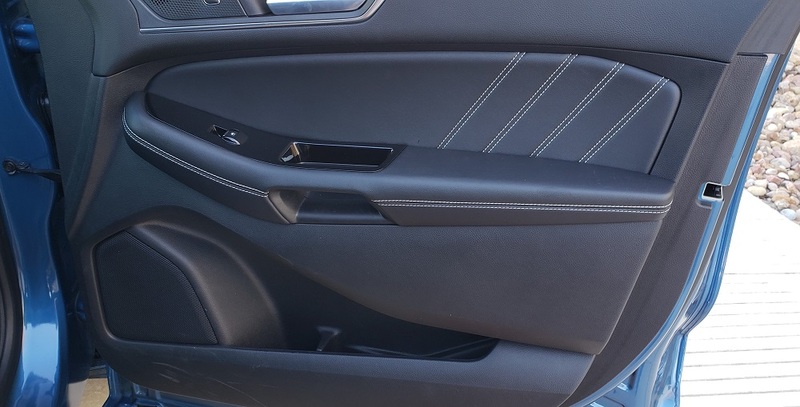 Edge ST is all about performance in technology and infotainment too starting with its new SYNC3 system featuring a Voice Activated 8-inch Touchscreen Navigation System with Pinch-to-Zoom capability. It’s AppLink Connectivity includes compatibility with Apple CarPlay, Android Auto, Ford+Alexa and Waze. Audio and infotainment are provided through the (tuned for Edge ST) Bang & Olufson 12-speaker audio system. It includes HD Radio, CD Player and SiriusXM satellite radio plus SiriusXM Traffic and Travel Link with 5-years prepaid service. 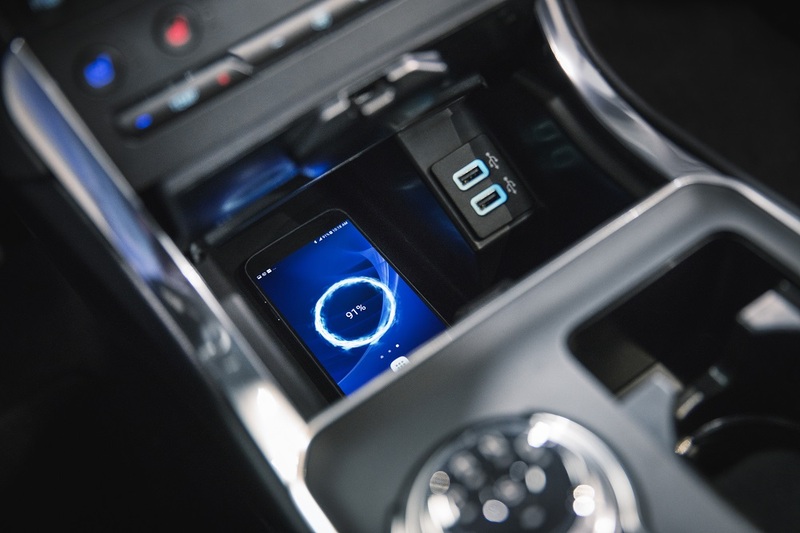 Other features included a FordPass 4G WI-FI Hotspot that connects up to 10 devices, Wireless SmartPhone Charging Pad, two Smart-Charging Multi-Media USB Ports and four 12V Power Points plus a 115V/150W AC Power Outlet. Wherever you sit with whatever you need to do – you can do it in the Edge ST.
As with the Titanium we drove earlier this year, the Edge ST features Remote Start, Push-Button Start, ST unique dual 4.2-inch Driver Configurable LCD Color Information Displays, Leather-Wrapped and Heated Steering Wheel with audio and cruise controls, 180-degree Front Facing Camera with Washer and Split View capability plus Ford’s Enhanced Active Park Assist with Parallel Park, Park Out Assist, Reverse Perpendicular Parking and All-Around Sensing System. The Edge ST does not skimp on safety. Features include Auto High Beam Headlights, BLIS (Blind Spot Information System) with Cross Traffic Alert, Lane Keeping Systems (Lane-Keeping and Alert and Driver Alert), Pre-Collision Assist with Automatic Emergency Braking (Pedestrian Detection, Forward Collision Warning, Dynamic Brake Support) and Rear-View Camera with Camera Washer. In addition, our ST was equipped with Wiper-Activated Headlights, Evasive Steering Assist, Lane Centering and Post Impact Braking, Advance Trac with Roll Stability and Curve Control plus Individual Tire Pressure Monitoring. Edge ST is also about adventuring anywhere you want to go as it allows you to bring along your toys too. Our Edge ST AWD came with a Trailer Tow Package complete with Hitch Cover and Trailer Sway Control – rated to tow up to 3,000 pounds. Get the complete scoop on all of the 2019 Edge models by going here: https://www.ford.com/suvs-crossovers/edge/.